This is a book that caused a bidding war. The war was won by publisher William Morrow. William Morrow’s vice president and executive editor is Daniel Mallory. Daniel Mallory is the real name of A. J. Finn. No, the acquisitions editor for William Morrow did not know who Finn was at the time she excitedly brought the work to her bosses. Mallory pulled off a good one. All Mallory’s years of dealing with books has had a salubrious effect on his work. He might have learned about pacing, building to a climax, narrative style, characterizations, the hook, tying off the package and bringing it home from all the books he read for work, pleasure, and research. He must be a natural writing savant, too. The bottom line is he has the goods. 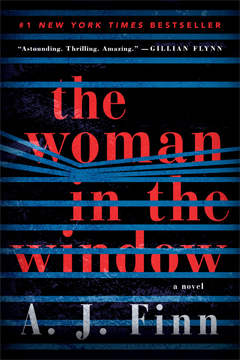 “The Woman in the Window” has a strong first-person voice; a set-up influenced by “Rear Window,” the fabulous book by Cornell Woolrich* and movie by Alfred Hitchcock; and a cry-worthy reveal about two-thirds of the way in. For a debut novel, there was nary a stumble. MILD SPOILER ALERT: If you want to be completely surprised by the story — and I wouldn’t deny you that delicious choice — read no further. So you won’t have to read to the end of the review, I’ll tell you now that this gets an MBTB star! Psychologist Anna Fox no longer lives with Ed and Olivia, her former husband and daughter. She lives alone and, although she talks frequently to Ed and Olivia, has limited contact with other people. PTSD is mentioned, a physical injury is mentioned. These are a few provocative pieces to the puzzle that may explain Anna’s disability. She has agoraphobia. Finn (not Mallory) does a blazingly good job of revealing her disorder fairly early. This is a great device to hamper her detecting ability. “Rear Window” gave us a neighborhood busybody, laid up by an injury with nothing to do, who looks out of his window and accidentally spies some spousal drama across the way. He eventually suspects the husband has murdered his wife. Woolrich ingeniously provides his amateur detective with very few resources to prove the murder, a murder without a corpus delicti. So, too, Anna — a fan of all those old suspense and noir movies — thinks she sees a murder in a nearby house, occupied by a newly ensconced family. She views the crime through the powerful lens of her camera, but fails to take a photo of it. 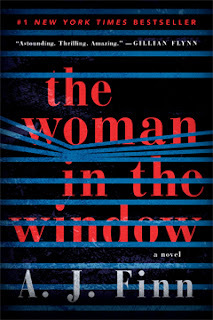 The wife, whom Anna believes was murdered, shows up to prove her existence to the police. But it is not the “Mrs. Russell” Anna had met earlier. Mr. Russell and their teenage son also disavow knowledge of a mysterious other wife and mother. See, Anna drinks a lot. And pops a ton of prescribed medication. For anxiety, depression, agoraphobia. It’s possible she was hallucinating because of the medication. It’s possible she is crazy. But, against all odds, it’s possible she is telling the truth. If so, who murdered the woman and how will Anna prove it? For someone who cannot leave her house, this is a monumentally difficult task. There isn’t a scrap of curtain, not a blade of blind, in number 212 — the rust-red townhome that once housed the newlywed Motts, until recently, until they un-wed. I never met either Mott, but occasionally I check in online: his LinkedIn profile, her Facebook page. Their wedding registry lives on at Macy’s. I could still buy them flatware. Also, what’s not to love about a detective called Little who is reassuringly large. He sort of becomes Anna’s protector. As the first big revelation neared, I knew what was coming because Finn had dropped hints. I had to take a long break before continuing. Finn unsparingly rips through that part of the story, and it was hard. But I emerged on the other side and it was beautiful. It almost doesn’t matter whether there was a murder or not. (I say that, but I don’t really mean it.) The genuine beating heart of the story is Anna’s journey. UPDATE: 3-7-19. There has been a lot of controversy about this book and its author, Daniel Mallory. You can read a New Yorker article here. It's confusing when the more intriguing mystery is about what happened in the creation of the book rather than in the book itself.